The spectacular fangs of sabertooth cats have been often seen as possible adaptations to pierce the hide of giant, thick-skinned prey such as proboscideans. But living elephants are such formidable creatures that it is difficult to accept that they would be the main targets of any mammalian predator. And yet there are pieces of evidence which clearly show that, at least in some instances, sabertooths did hunt proboscideans. At Friesenhahn cave in Texas ( a fossil deposit of late Pleistocene age) the bones of several sabertooths of the genus Homotherium, including individuals of different ages, were found in association with those of many mammoths and mastodons. 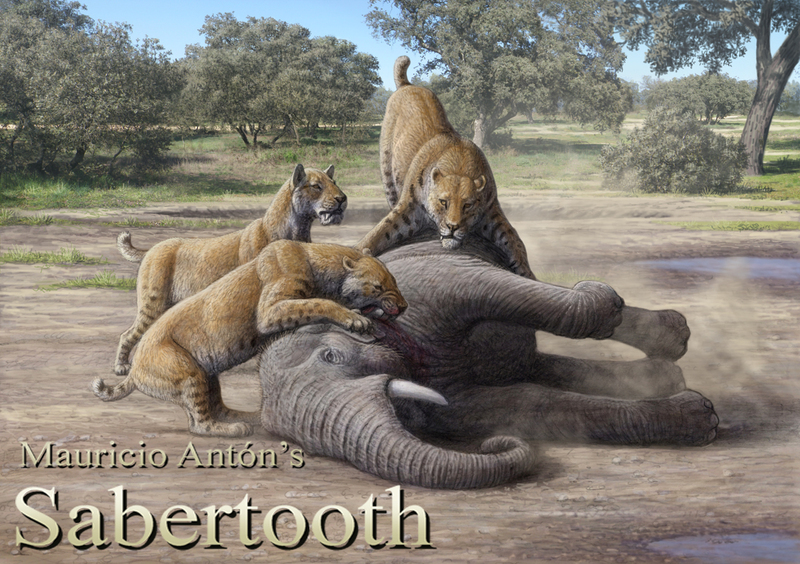 The place was in all likelihood used as a den by the cats, and the proboscidean bones show clear tooth marks, proof that the sabertooths were eating from them at the site. The proboscidean bones corresponded to animals between 2 and 4 years of age, a time when they are still of “manageable” size for the predators, but less closely vigilated by the mothers who need to concentrate in protecting their younger, more vulnerable calves. But even at such young age, elephants make rather inconvenient prey. Even with the long and flattened canines of Homotherium, the diameter of the elephant neck is just too big and the skin too thick for an efficient killing bite to take place, so the dispatching of prey is by necessity long as it gets slowly weakened through blood loss from relatively superficial wounds. On the other hand, the sheer size and strenght of even a calf of this age makes it very difficult for a single cat to keep it pinned down to the ground. This disadvantage is made more serious by the fact that Homotherium, unlike other sabertooths, had long forelimbs with narrow wrists and small, not fully retractable claws (except for the enormous dewclaw). The scene below shows a group of Homotherium and a young mammoth in the early Pleistocene of Southern Spain. So, if we look at the overall anatomy of Homotherium we see that it was not an ideally built “elephant killing machine”. In terms of the ability to single-handedly wrestle down a large prey, even a lion is better equipped, but then the sharp canines of Homotherium were a real advantage to inflict nasty, debilitating wounds. First, that in order to bring down young proboscideans as the Friensenhahn cave sabertooths obviously did, hunting in a group would be a distinct advantage, and in fact it was probably a necessary condition. Second, that since the overall body build of Homotherium was not that of a “giant slayer”, the odds are that the systematic elephant predation we see at Friesenhahn was either a local phenomenon, or a seasonal one, or both. Elsewhere and at different times of the year, there was probably a variety of prey for Homotherium to take, but my guess would be that it most often concentrated on ungulates of horse to bison size, and whenever it had to hunt individually, it would certainly go for lighter animals like horses or antelope. So, giant slayer? potentially yes, but only under the right circumstances. To learn more, look for the book “Sabertooth” in late october! Posted on 17/07/2013, in Uncategorized. Bookmark the permalink. 8 Comments. Very thought provoking post. I think you are on to a very good hypothesis here, there was an isotopic study done on Smilodon fatalis teeth from La Bera. You are probably familiar with this study, it revealed smilodon was mostly preying on bison and horses. Although I think there was also some evidence of mammoth and ground sloth, sounds like bison and horse were the bulk of their diet. So there is another saber-tooth that may not have been “giant slayer.” Can’t wait to read your new “SaberTooth” book! Yes, I know that study, and it does contribute to the picture of sabertooths as predators that were taking the most abundant and reasonably sized prey. Such prey was not much larger than that preferred by “normal”, conical toothed cats, but sabertooths would have been faster and more efficient at killing them. The advnatage of killing in seconds rather than minutes meant less danger of being injured by trashing prey, and less danger of the kill being detected by competing predators due to the noise and dust of a prolonged struggle. In the face of such advantages, taking young mammoths now and then would be welcome but it would not really make the difference. First off I can’t wait for the new book!! Super excited!!! Dogs: Their Fossil Relatives and Evolutionary History, The Big Cats and Their Fossil Relatives & Evolving Edan are my favourite books of all time can’t wait to add this one to the collection. A facinating and thought provoking article on Homotherium (my fav cat). It’s always puzzled me with its slender form, unusual proportion & deadly ability to take down very powerful prey. Have any other den sites been discovered with other prey remains? There must be so much more to this story than just another ungulate hunter. What selective pressures would have caused such a highly derived anatomy? In a landscape filled with generalist hunters (atrox) powerful ambush wrestlers (smilodon) and speedy plains racers (miracinonyx) it must of occupied a specific ecological niche. Something that doesn’t exist today. It’s a mystery that if homotherium was a ungulate hunter taking down the odd proboscidean every now & then, it should of survived in Africa where I believe it also once existed (correct me if I’m wrong). Was it converging with hyenas in North America turning into a scavenger using its larger nasal cavities to sniff out distant carcasses. Is there any evidence of anatomical changes over time that showed decrease in the length of its canines & cheek teeth becoming more robust to become a bone-crushing cat? I believe no bone crushing hyenas made it to the Americas (again correct me if I’m wrong). Maybe homotherium specialised on horses, perusing its prey over long distances and the decline in horses caused its eventual extinction. Then again there are plenty of Equids in Africa. Maybe it was out-competed there by more generalist hunters like lions, hyenas & humans. The story is indeed complex. The dentition of Homotherium leaves no doubt about one thing: it was not a specialized scavenger, in fact it was less well prepared than any other felid for scavenging. Its cheek teeth developed in the opposite direction, ever more cutting and less crushing. The similarities in body porportions with hyenas suggest that, like hyenas, Homotherium would roam long distances in large home ranges. It is also possible that it was less sedentary than most felids, and able to follow migrating herds to some degree. Spotted hyenas do that, they “commute” territories in order to go where migrating herds are, even if they have to cross the territories of neighbouring clans. The big muzzle of Homotherium had more to do with tooth morphology than with olfactory abilities. Coexistence of Homotherium with Smilodon and Panthera in North America was a complex thing. Homotherium fossils are very scarce in Rancho la Brea where the other large felids dominate. Then in Alaska there are plenty of Homotherium fossils and no Smilodon. So there was some degree of exclusion -not total, but exclusion after all. There are many more ingredients to this story -many of which I discuss in “Sabertooth”. But of course there is a lot that we simply don’t know! Facinating, a northern, migratory hyper carnivor built to wear prey down with long chases followed by a quick dispatch. If only I could travel back in time to see these guys in action! Can’t wait to read the book! though it will probably leave me with even more questions.